Large - $53.99 Only 3 left! Your kid is the oldest and thus, the natural leader. He demonstrates dedication, bravery, and decisive action every day. He’s pretty good at wrangling his younger brothers, he handles his chores and responsibilities well, and he really, really loves pizza. Wait just a minute. Are you raising a child, or a mutant reptile? 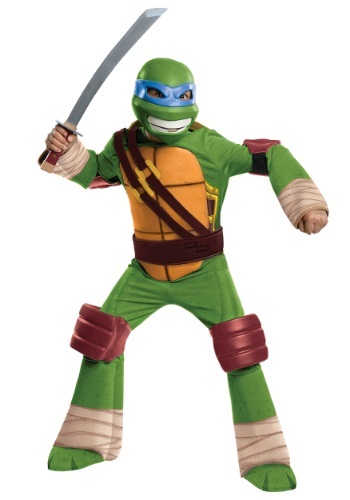 Your son sounds an awful lot like Leonardo, inarguably the coolest of all the Teenage Mutant Ninja Turtles. Not sure? Well, let’s see...does he spend hours a day practicing his ninja skills? Does he try all morning to keep his brothers in line, and sometimes end up bossing them around? Have you noticed him wearing a lot of green or putting up heat lamps up over his bed? Well aren’t you lucky! You’re the proud parent of a genuine icon! This Deluxe Child Leonardo Costume, then, will allow your child to become who he really is: the fearless leader of the Teenage Mutant Ninja Turtles! Seeing how he already eats, sleeps, and breathes ninjutsu, this is his costume. Maybe you’d like to get the other characters for the family and try them out as a Ninja Turtle crew (it could be genetic!). Either way, your little leader will love putting on this molded jumpsuit and full face mask, complete with Leo’s signature blue hue. All he has to do is add that pair of plastic katana swords you found in his closet and he's well-equipped to step into his new role!